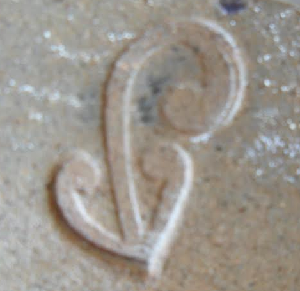 This mark doesn't exactly match the one recorded in the Potters Marks book, but Michelle is the only potter that I know of that uses a kowhaiwhai mark. 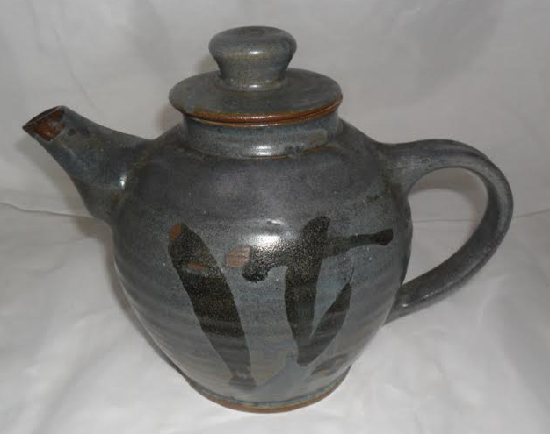 Jeremy, I noticed that you posted this mark as Mike Regan's on the NZ Studio Pottery page and it was acknowledged by Mike, so I will correct the mark in the gallery. Yes, that is Mike's old mark. I recognised it when I bought the jug because he had given me one of his old mugs with the same mark. That old stamp is long gone now. He was signing work with his name last year. I have a signed mug too. Mike told me he wanted to make a mark based on an Irish crown so I suggested the claddagh which incorporates hands, heart, and crown. It is a tradional image on Irish jewellery. I think it was his wife the Mayor who bought the claddagh ring he now uses for his pottery mark. I'll get a photo of that new mark some time soon.